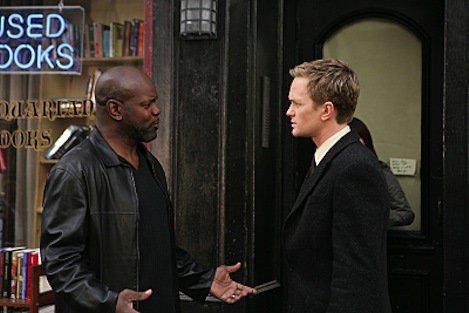 Emmitt Smith sidesteps a football question on How I Met Your Mother. ***The Feb. 11th Grammy Awards on CBS will have an arresting opening act in The Police. Sting and former mates Stewart Copeland and Andy Summers have agreed to reunite for the first time since the band's breakup 25 years ago. CBS also announced a half-dozen new presenters -- Joan Baez, Stevie Wonder, Chris Rock, Melissa Eheridge, Queen Latifah and Jennifer Hudson. Sting also has a lute concert set for Feb. 26 on PBS' Sting: Songs from the Labyrinth. After a Jan. 13 performance for TV critics in Pasadena, he played coy but acknowledged that something was up. "We started 30 years ago, so it would be nice to do something to celebrate," he said. "We don't quite know what, but we're talking about it." Sting said he left The Police to "mature as a musician and to try more things than a band is able to do. A band is very constricted . . . But we're still great friends." ***David Letterman hits the quarter-century mark in late night television on Thursday (Feb. 1). He'll celebrate with redoubtable Bill Murray, who was guest No. 1 on both his first NBC show in 1982 and his inaugural CBS Late Show in 1993. Letterman's other anniversary guest will be Cleveland Cavaliers star LeBron James. ***Reigning Dancing with the Stars champ and former Dallas Cowboys great Emmitt Smith will play himself on the Monday, Feb. 5 episode of CBS' How I Met Your Mother. His principal scenes are with date-a-holic Barney Stinson, played by Neil Patrick Harris. CBS is billing it as "Legendary 'Player' Meets Legendary Football Player." To see an instant clip of Smith the thespian, go here.